What does Kinsey Scale mean? The Kinsey Scale is a self-assessment tool that conceptualizes sexuality as a spectrum rather than a binary where everyone is either unambiguously gay or straight with no exceptions. The Kinsey Scale is, fundamentally, based on how many times in your life you feel or act in a sexual way towards one gender or another. Yes, but I should add that historically, across generations, you’ll find individuals saying they’re “mostly” heterosexual on the Kinsey scale. Where does Kinsey Scale come from? 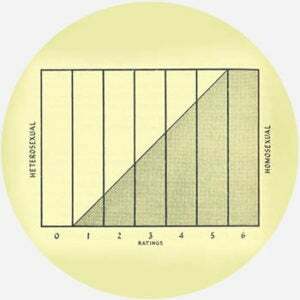 The Kinsey Scale, first known as the Heterosexual-Homosexual Rating Scale, was created in part by sexologist Alfred Kinsey and used in a study first published in Sexual Behavior of the Human Male in 1948. It was also included in a subsequent work, Sexual Behavior of the Human Female, in 1953. In these studies, known as The Kinsey Reports, sexologists asked people an inventory of questions about their sexual history and assigned them a number on a scale of 0–6, which corresponded to a description of their sexual behavior. A score of 0 represents “exclusively heterosexual,” 6 is “exclusively homosexual,” and 3 is “equally heterosexual and homosexual.” Other academics picked it up soon after, and, by 1953, they had begun calling it the Kinsey Scale. By the 1970s, the term enjoyed wider adoption within academia, and by at least the early to mid-1990s non-academics began to use it too. This coincides with increasing public awareness and acceptance of sexualities (other than heterosexuality), and it was somewhat amplified as celebrities like Ellen DeGeneres were coming out. Now, in the new millennium, sexual identities like pansexual and polysexual have been more widely adopted, as have gender identities such as trans and intersex. As a result, the framework of the Kinsey Scale seems outdated, since it doesn’t account for emerging sexual orientations or genders. There have been attempts at devising a new scale, of which over 200 exist. While some take issue with the scale, some social scientists and individuals alike continue to find it useful while recognizing its limited nature. If anything, the scale acts as an accessible jumping off point for understanding sexuality as a continuum. Sexologists often use the term and the numbers from the scale in research studies and as a formal research tool. However, these numbers are also used as a tool of self-identification. People can declare that they are a certain value on the scale when they want to be more accurate in describing their sexual identity. The scale itself is numbered from 0–6. A person who’s a Kinsey 0, as some users say, would be completely straight according to the instrument, whereas a Kinsey 6 would be completely gay. Other numbers indicate varying degrees of bisexuality. A Kinsey 1 is a person who’s predominantly heterosexual, but is incidentally homosexual. This type of person might consider themselves straight until they meet the right person. Likewise, a Kinsey 5 would be the same, but predominantly homosexual. A Kinsey 2 or 4 might be someone who relates more closely to bisexuality and could think of themselves as being “bisexual with a preference.” A Kinsey 3 would be someone closest to the typical conception of bisexuality and would have an equal attraction to men and women.